This year saw many of the great artists of the past put out compelling records; Neil Young’s Living With War, Dylan’s Modern Times, Tom Petty’s Highway Companion, Mark Knopfler’s collaboration with Emmylou Harris (which is in my top 10), and Bruce Springsteen’s Seeger Sessions. I love new music and new artists. I don’t subscribe to Jackson’s assertion that “the last great record was made in 1991.” I think anyone who thinks that has just stopped trying to find and listen to new music and they have nobody to blame but themselves for the lack of good new music in their lives. But the artists of the 60s, 70s, and 80s were a special group. Bob Lefsetz is right that those were the magical years of rock music. And so it’s great to see the legends of that time remain important contributors. In some ways I am giving honorable mention to all of them and not just the ones I mentioned at the top of this post. 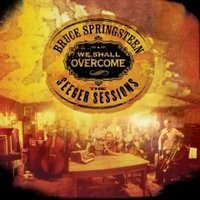 But the one record that sums this up for me this year is Springsteen’s Seeger Sessions. His choice to cover great folk songs with a big raucous band is a telling one. Bruce is saying that music is timeless and it lives on forever. One of my top music moments of the year was at Saratoga Springs in mid June watching Springsteen do his traveling show outside on a beautiful night with my son Josh and our friends. About 2/3 of the way through the set, after a particularly high energy number, Josh looked up at me and said, “Dad this is a great show”. Springsteen made music written many years ago relevant to my ten year old son. And that is a gift, to me, to Josh, and to everyone who has the record and/or saw the tour. I went through a period where I listened to the record every day. But it didn’t last that long and I am listening to it now for the first time in months. It’s not one of my top ten records this year. But it’s a great record nonetheless and it certainly deserves an honorable mention.